An example of a wide receiver's positioning in an offensive formation: split end (SE) (now wide receiver), slotback (SB), tight end (TE), wingback (WB), and flanker (FL) position. A wide receiver, also referred to as wideouts or simply receivers, is an offensive position in American and Canadian football, and is a key player. They get their name because they are split out "wide" (near the sidelines), farthest away from the rest of the team. Wide receivers are among the fastest players on the field. 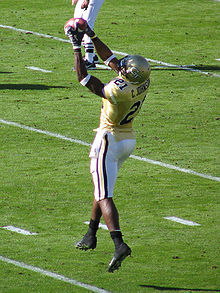 The wide receiver functions as the pass-catching specialist. The wide receiver's principal role is to catch passes from the quarterback. On passing plays, the receiver attempts to avoid, outmaneuver, or simply outrun defenders (typically cornerbacks or safeties) in the area of his pass route. If the receiver becomes open, or has an unobstructed path to the destination of a catch, he may then become the quarterback's target. Once a pass is thrown in his direction, the receiver's goal is to first catch the ball and then attempt to run downfield. Some receivers are perceived as a deep threat because of their flat-out speed, while others may be possession receivers known for not dropping passes, running crossing routes across the middle of the field, and generally, converting third down situations. A receiver's height also contributes to their expected role; taller receivers tend to play further to the outside and run deep more often, shorter receivers tend to play inside and run more routes underneath the top of the defense. A wide receiver has two potential roles during running plays. Particularly in the case of draw plays and other trick plays, he may run a pass route with the intent of drawing off defenders. Alternatively, he may block normally for the running back. Well-rounded receivers are noted for blocking defensive backs in support of teammates in addition to their pass-catching abilities; Hines Ward in particular received praise for his blocking abilities while also becoming the Pittsburgh Steelers all-time leading receiver and one of 13 in NFL history with at least 1,000 receptions. Sometimes wide receivers are used to run the ball, usually in some form of an end-around or reverse. This can be effective because the defense usually does not expect them to be the ball carrier on running plays. For example, wide receiver Jerry Rice rushed the ball 87 times for 645 yards and 10 touchdowns in his 20 NFL seasons. In even rarer cases, receivers may pass the ball as part of a trick play. A receiver can legally pass the ball so long as they receive the ball behind the line of scrimmage, in the form of a handoff or backwards lateral. This sort of trick play is often employed with a receiver who has past experience playing quarterback at a lower level, such as high school, or sometimes, college. Antwaan Randle El threw a touchdown pass at the wide receiver position in Super Bowl XL playing for the Pittsburgh Steelers against the Seattle Seahawks. Antwaan Randle El played quarterback for four years at Indiana University. Wide receivers often also serve on special teams as kick returners or punt returners, as gunners on kick coverage teams, or as part of the hands team during onside kicks. The wide receiver grew out of a position known as the end. Originally, the ends played on the offensive line, immediately next to the tackles. By the rules governing the forward pass, ends (positioned at the end of the line of scrimmage) and backs (positioned behind the line of scrimmage) are eligible receivers. Most early football teams used the ends as receivers sparingly, as their position often left them in heavy traffic with many defenders around. By the 1930s, some teams were experimenting with moving one end far out near the sideline, to make them more open to receive passes. These split ends became the prototype for the modern wide receiver. Don Hutson, who played college football at Alabama and professionally with the Green Bay Packers, was the first player to exploit the potentials of the split end position, and is widely credited as inventing the wide receiver position. As the passing game evolved, a second wide receiver position was added. While it is possible to move the opposite end out wide for a second split end position most teams preferred to leave that end in close to provide extra blocking protection on the quarterback's blind side. That player was essentially playing the modern day tight end position. Instead of moving the blind side end out, one of the three running backs was split wide instead, creating the flanker position. The flanker lined up off the line of scrimmage like a running back or quarterback, but split outside like a split end. Lining up behind the line of scrimmage gave flankers some advantages. Flankers have more "space" between themselves and a pressing defensive back, so cornerbacks can not as easily "jam" them at the line of scrimmage. This is in addition to being eligible for motion plays, allowing for the flanker to move laterally before and during the snap. Elroy "Crazy Legs" Hirsch is one of the earliest players to successfully exploit the potentials of the flanker position as a member of the Los Angeles Rams during the 1950s. While some teams did experiment with more than two wide receivers as a gimmick or trick play, most teams used the pro set as the standard set of offensive personnel (a flanker, a split end, a half back, a full back, and a tight end). An early innovator, coach Sid Gillman used 3+ wide receiver sets as early as the 1960s. In sets that have three, four, or five wide receivers, extra receivers are typically called slot receivers, as they play in the "slot" (open space) between the furthest receiver and the offensive line. In most situations, the slot receiver lines up off the line of scrimmage like the flanker position. The first use of a slot receiver is often credited to Al Davis, a Gillman assistant who took the concept with him as a coach of the 1960s Oakland Raiders. Other members of the Gillman coaching tree, including Don Coryell and John Madden, brought these progressive offensive ideas along with them into the 1970s and early 1980s, but it was not until the 1990s that teams began to reliably use three or more wide receivers, notably the "run and shoot" offense popularized by the Houston Cougars of the NCAA and the Houston Oilers of the NFL, and the "K Gun" offense used by the Buffalo Bills. Charlie Joiner, a member of the "Air Coryell" San Diego Chargers teams of the late 1970s and early 1980s, was the first "slot receiver" to be his team's primary receiver. Flanker/Flanker back (Z or FL or 6 back): A receiver lining up behind the line of scrimmage. Frequently the team's featured receiver, the flanker uses the initial buffer between himself and a defender to avoid immediate "jamming" (legal defensive contact within five yards of the line of scrimmage). The flanker is generally on the same side of the formation as a tight end. As with the split end, this receiver is the farthest player from the center on his side of the field. The flanker is usually lined up just like a split end except that he is just behind the line of scrimmage, therefore being in the backfield and not on the line. Slotback: A receiver lining up in the offensive back field. Canadian and arena football allow them to take a running start at the line. They are usually larger players as they need to make catches over the middle. In American football, slot backs are typically used in flexbone or other triple option offenses, while Canadian football uses two of them in almost all formations (in addition to two wide receivers and two running backs).